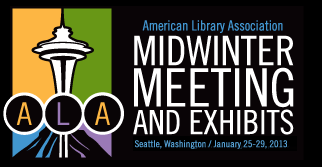 I’m in Seattle for the next few days, attending ALA Midwinter 2013. There’s lots of good stuff for marketers on the schedule – I’ll live tweet from as many events as possible and post a roundup of the conference next week. I’ll be at the PRTalk gathering this afternoon and if you are here in Seattle and want to connect, shoot me an email at 658point8@gmail.com or find me on Twitter at @658point8. In the age of e-books, maker spaces, and mobile apps, the conversation I want to lead in my library is about a non-technical, yet vitally important topic: customer service. We are about to embark on a $19 million renovation and expansion that includes more computers, a maker space, and state-of-the-art technology throughout the building. However, as a marketing director who previously spent nearly twenty years on the reference desk, I realize that none of this will be meaningful change, unless we have great customer service to back it up. I would lead this discussion by first ditching the term “customer service.“ Instead, I would talk about how today’s most successful public libraries are customer-centric. This goes beyond a smile at the reference desk. Being customer-centric means that every decision is made with our customers’ wants and needs in mind. A customer-centric organization is truly engaged and clearly relevant. As marketing director, I can help make our library a customer-centric on by analyzing demographic data, identifying best practices, and starting conversations with our community. But to truly transform Lawrence Public Library into a customer-centric organization, I will need to energize and motivate staff and show them the value and reward of a customer-first approach. At ALA Midwinter, I look forward to learning from and networking with professionals from cutting edge, customer-centric libraries so that I can return to Lawrence ready to lead the change — armed with great ideas and a smile from the marketing desk. Each winner outlined a fresh approach to connecting with both patrons and colleagues to drive change in his or her library. Nonetheless, all of the essays shared a common theme of making patrons’ needs the central focus of the library’s goals and decisions. Some strategies for achieving this objective, according to the winners, include implementing more customer-centric decisions in the library; using the power of social media to serve under-reached patron groups; and bringing together patrons and library staff to meet the challenges associated with access to exclusive content. You can read the other winning essays here. I am so thankful to EBSCO and ALA for giving me the opportunity to come to Seattle and connect with other libraries and library marketers. Keep an eye out here for what I learn! I just read a great article about the New York Public library lending out an American Girl doll on the honor system. The librarian who took the initiative to think outside the box displayed the kind of customer-centric focus you talk about.